Hello family! Nyamabuga is beginning to see growth and we are excited to share this newest update with you! 69 new pupils this intake!! Total number now is 221!! Brand new maize mill finally operational! Serving both school and community. The little ones gleaned some basic agriculture skills on our school orchard. We grew papayas, pineapples, and bananas. Meanwhile at the farm, getting ready for the next corn growing season. Who taught who a lesson? Teachers playing against students. Greetings from Nyamabuga Primary School! February brought along much needed rain, a blessed relief after a long period of drought. We were pleasantly surprised at the extra number of pupils, 69 new enrollees!! The latest count shows that we are now at 200 students plus office staff and workers. We can proudly say the school is growing! The Demonstration farm within the school has been an amazing success!! The young children are eagerly learning fundamental gardening skills. The school orchard looks great! We have harvested pineapples, papayas and bananas. The young orange seedlings are growing as well. We hope to see some oranges, mangoes and passion fruit around the school within the year! Praise God for a constant power supply! We are now able to mill corn harvested from the farm and in the process, also help the surrounding community. In the past, villagers traveled to neighboring trading centers just to get maize meal. Cobs and bran are used in the farm to fertilize and feed little piglets. We still have challenges at supplying enough safe water for the children, especially during the dry season when the rainwater collection system runs low. We are now praying for an underground water system that can be pumped straight to the main storage system. The children do not yet have a dining hall, so they have their meals in the dorms. We are praying for a roofed structure that can serve as a communal place for lunch time and other activities. Let us keep praying for that. We are proud of the farm! 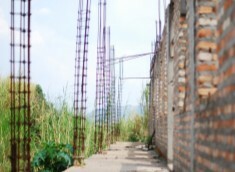 It has been able to supplement the feeding costs of the school. We just had our last corn harvest this February, and we are now preparing for our next planting season. We are clearing more unused land this season, and hope to pump water from the stream uphill to help with watering. We are thankful to each of you for your prayers and support. A Guest House at Nyamabuga! Copyright © 2018 NEEPUganda All rights reserved.